The Shannon One Design (SOD) is a traditional sailboat unique to the lakes of the River Shannon. It is a wooden, clinker-built, eighteen-foot (5.49m) racing dinghy, propelled by a single gunter-rigged mainsail of 140 square feet (15.6 sq.m). The boat has a relatively narrow beam of 4 feet 10.5 inches (1.5m), and draws 4 feet (1.23m) with her centreboard down. On the 29th January 1920 a meeting of delegates from the Lough Derg Yacht Club, Lough Ree Yacht Club and The North Shannon Yacht Club (originally located in Dromod) was held in the Prince of Wales Hotel in Athlone to set about the introduction of a one-design class racing boat on the Shannon. Up to that point there were many different types of boats, in particular 18 footers which were sailed and raced on the lake. They selected the "Design 102" from the office of Morgan Giles a then very expert and now very famous boat designer and which today is the Shannon One design. The SOD was a further development of his prior Essex One Design dinghy. The whole concept of "One Design" was then (1920) quite new, as previously boats were all different, so racing was by handicap and it was never easy to either get the handicaps right or appease those who lost out. A "One Design" allowed boats to be more or less equal, and so the boat which finished first won the race. The difference was the sailor, and how he/she sailed the boat, but not the boat! It is built in a very traditional fashion, with overlapping planks laid over timber ribs which gives the boat its attractive shape and lines. While of old design, new boats are still being made, with an extensive programme of events and regattas throughout the summer months. The first SOD was ordered in 1921 from Athlone boatbuilder Walter Levinge (Another great character of the SOD Class). Its owner was L. Graham (Boy) Toler, and his boat was named ‘Phyllis’ , and later numbered SOD 43 and renamed ‘Red Boat’ in 1923. The new class should have commenced numbering at No 1, but this did not happen. Numbering of the following boats began at number 32. The SOD boat register now stands at No 178 as of 2012. Racing for the Shannon One designs started in earnest in 1922, under the rules adopted at that time, and has continued ever since. New hull and sail specifications were adopted in 1989 to take into consideration new marine technologies, equipment and materials, while retaining its traditional wooden construction. SODA, the Governing Body of the Class, is currently updating (January 2017) the Class Rules & Specifications which, when and if approved by the SODA Members, will be published in a new book - known as "The Pink Book". With a large sail and comparatively narrow beam, a SOD is a lively performer, especially in a fresh breeze, and requires a three-person crew for normal sailing. The boats are unique to the river Shannon and are actively raced in both Lough Ree Yacht Club and Lough Derg Yacht Club. SOD sailing attracts a wide range of sailors, both in age and skill but also in location with many from far and wide, not simply limited to Shannon riverside dwellers. 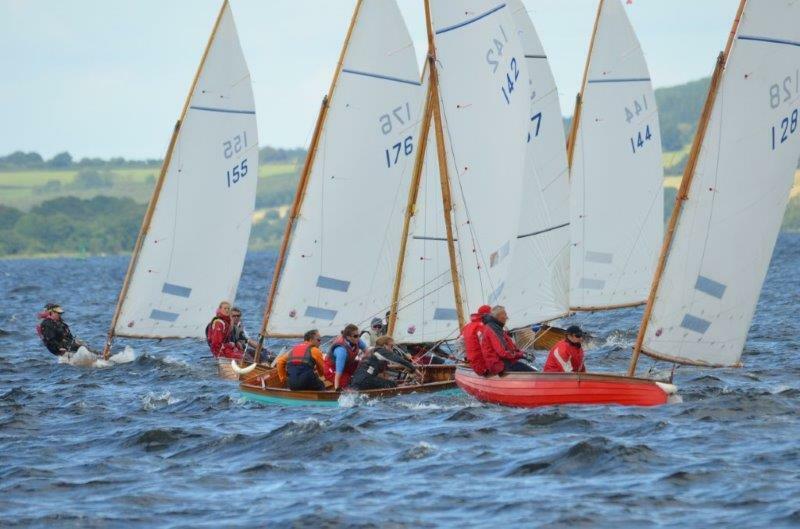 At the two main events each year, the week-long regattas at Ballyglass on Lough Ree and Dromineer on Lough Derg, up to 55 SODs have competed. These will be sailed by a mixture of local sailors and others based in Dublin or elsewhere (as far away as the USA), most of whom return year on year to compete. The Shannon One Design Class Association (SODA) was established in 1961, has its own website www.soda.ie it is the Governing Body charged with maintaining the great traditions of the Class going forward.